Returning to work in winter has meant I not only get to wear my neglected pencil skirts that were packed away in pregnancy, but also some of my winter knits I haven't seen in a while! I had a little fun trying to create monochrome outfits, even if one of the outfits wasn't my first choice for what to wear. It had always been a bit of a snug fit and my diastasis recti wasn't helping the situation. I was able to take the time to find something else that fit, this lovely pencil skirt. Hooray for elasticated waists! Still managed to achieve a monochrome look liked I'd first planned by picking this lovely grey beaded knit to wear with it. Not a bad outfit, one that looks quite nice in the photos actually, just not what my first choice had been! 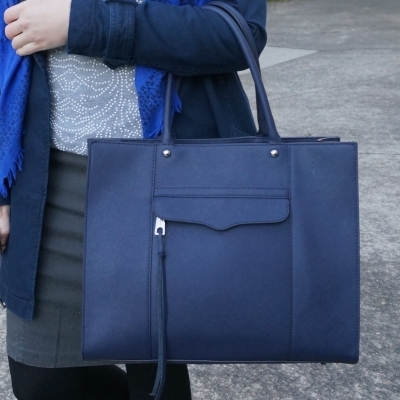 Last worn: navy mac, cobalt scarf, beaded jumper, grey pencil skirt, silver ballet flats, Rebecca Minkoff medium MAB tote. Other ways to wear: navy mac and striped dress, cobalt scarf and maxi skirt, beaded jumper and skinny jeans, grey pencil skirt and floral cami in summer, silver ballet flats and purple jeans, Rebecca Minkoff medium MAB tote and plaid shirt. Perfect for pregnancy: embellished jumper in first trimester, grey pencil skirt and hidden 20 week baby bump, Rebecca Minkoff medium MAB tote and wrap dress in third trimester. Unlike the outfit above, this planned outfit worked perfectly. This pencil skirt is stretchy and has an elasticated waist - it worked quite far into my pregnancies too! No scarf with this outfit so I took the chance to wear my favourite statement necklace. I didn't need the scarf as it was supposed to get up to summer temperatures in the middle of the day. I did however need the cosy knit to keep me warm on my very early morning commute. I'm usually up and out the door early, but had to leave just as the sun was starting to rise, which is the reason for the colours being slightly off in the photo. You can see the lights still on behind me in the dark! Thankfully my camera copes okay with low light settings and the photo doesn't look too bad. I also got to see a beautiful sunrise while waiting for the train, so a pretty good morning overall. 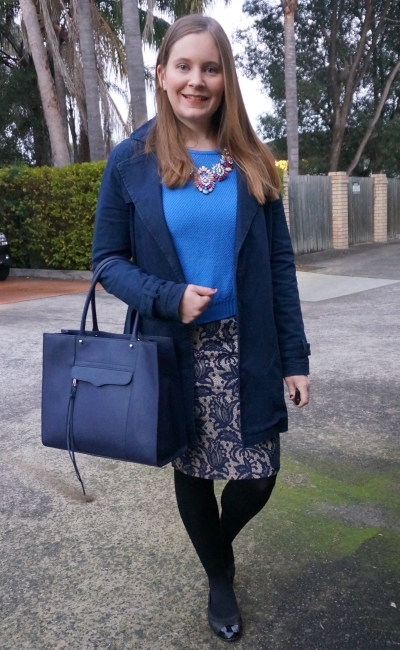 Last worn: navy mac (above) cobalt knit, lace pencil skirt, black ballet flats, Rebecca Minkoff medium MAB tote (above). Other ways to wear: navy mac and burgundy dress, cobalt knit and teal maxi dress, lace pencil skirt worn casually, black ballet flats with blush and olive, Rebecca Minkoff medium MAB tote and printed dresses. Perfect for pregnancy: cobalt knit in early first trimester, lace pencil skirt and third trimester bump, ballet flats in third trimester, Rebecca Minkoff medium MAB tote and wrap dress in third trimester. 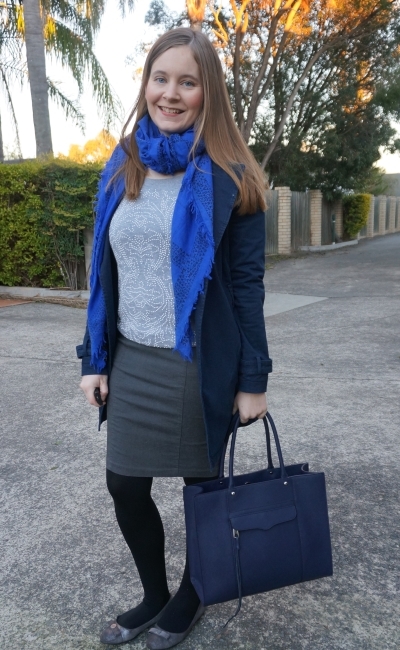 If you're unsure how to wear your pencil skirts to the office in winter, add some cosy tights (mine are fleece-lined!) and a matching knit. It's an easy, monochrome outfit that will keep you warm. If your office dress code is more formal or corporate, it's easy to layer a button up shirt under your knit and take your jumper off when you reach your desk. Linking up with Turning Heads, Confident Twosday, Style Sessions, Wardrobe Wednesday, Style On The Daily. I'm loving these shades of blue together, I must try that. The lace design is beautiful. You look so classy and well put together. Yes, the fit of some clothes after pregnancy can be tricky. I weigh less than I did before I got pregnant with my daughter, but still some cloths don't fit me comfortably. Yes, I think the body type changes even if the weight doesn't! Happy new week! Adore both looks. The blue coordinates beautifully and each look is very streamlined and professionally polished! Pray you have a great week! I can't believe you're already back to work! Love pencil skirts and that colour combo on you! I know, the past 17 or so months flew by! I do love a pencil skirt and elastic waist! Yea, when I used to have to leave for work super early in the morning I would always try on my outfit the night before and then lay it out so I could just get dressed and go. Definitely makes things easier! Lovely outfit! I love Rebecca Minkoff bags! Such a good idea to try stuff on and "test drive" it the night before, especially things you haven't worn in a while! I love the patterned pencil skirt - great piece! Yes, I'm going to keep doing it, even though I'm tired at the end of the day as it's a time saver in the mornings! It is great you remembered to try that pencil skirt from the first outfit, this way you could find a suiting replacement. I often forget to try on what I plan to wear and then I end up stressed because I can' t find anything last minute. Anyway, I love that first outfit. The neutral colour scheme is so lovely. Elegant and pretty. The second outfit is very pretty too....love that skirt, it has such a nice print. Aww I can imagine dressing post pregnancy can be a bit tricky. You pull it off with aplomb, as usual! Love both outfits! I have diatasis recti too and I am not looking forward to seeing how bad it is after this one! Your second outfit is gorgeous! The pencil skirt is lovely with your cobalt sweater! Love the combination! I think you did a great job with those double blue looks. 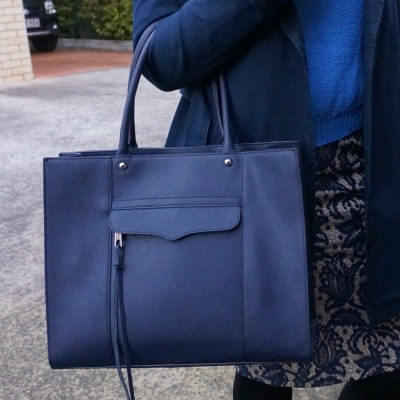 I am all for that great blue bag. This look is so nice for when it is cold, I love what you wore! Blue has always been my favourite colour on you. I love the skirt in the second outfit. I think I'd be lost without stretchy pencil skirts, haha. And I think they can work so well layered up for winter. I really love your patterned one! Yay for elastic waists! There are certain things that I've avoided after having kids--some things that technically fit just don't look the same. I think you look fantastic, and I love both of these looks. That pencil skirt in your second look is so fun! Yes, that's it exactly! things look different as you look different as a mum! I'm not too upset by the skirt not fitting. I've learned to try things on especially for vacations too, Mica!! For some reason, even just how certain things pair together looks different on the body than off the body!! It may take a couple of minutes longer, but it's so worth it!! Love the blue on you!! It's totally your color! I'm loving blue on blue at the moment too. So much so that I've taken to umm.. wearing jeans to work on days other than Friday. Thanks for some more polished ideas I can borrow for the coming week. Mica, I love pencil skirts. Love yours! They both look great on you. Also love your Marc by Marc Jacobs silver tuxedo flats. They're so pretty :D You do a great job layering. So you really love blue. Can't blame you. I have more than a couple of blue dresses in my closet. They're very pleasing and cool to the eyes. Very pretty mix of blues and greys! I love the pencil skirt on you and of course the scarf. Youre getting me excited for the next season. Fall is my favorite. I love all the shades of blue here and how your scarf really pops! This is a very nice combination of blue and grey... I especially like the handbag! I love this purse and lace skirt. I can't wait until the cooler weather so I can pair my pencil skirts with some tights. Ooh that bag is to die for! I'm pretty useless at dressing myself, so I am going to use some of your suggestions! Perfect formal look, i like it!